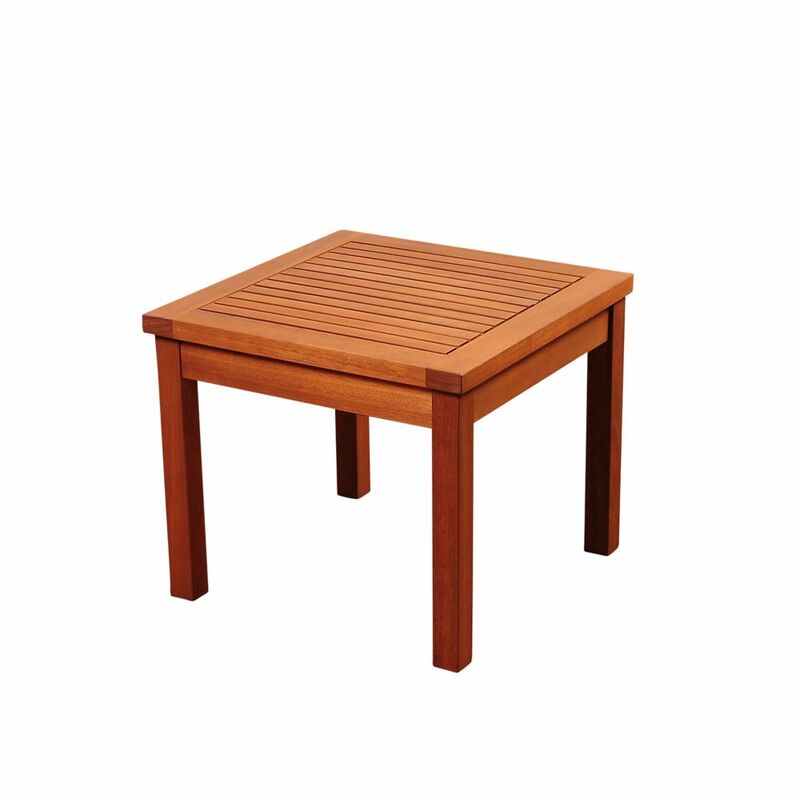 Murano Eucalyptus Square Patio Side Table The Amazonia Collection is committed to providing premium quality sets with an elegant design that will make your home stand out above the rest. Crafted from solid Eucalyptus Grandis wood, grown in 100% managed forests in Brazil and certified by the FSC (Forest Stewardship Council), this eucalyptus furniture is known for its longevity and craftsmanship at an affordable price. Enjoy your patio in style with these great sets from our Amazonia Collection. Murano Eucalyptus Square Patio Side Table is rated 4.5 out of 5 by 14. Rated 5 out of 5 by VC3 from Handsome table, I bought three of them - nicely made, easy to assemble. They are a very good mat... Handsome table, I bought three of them - nicely made, easy to assemble. They are a very good match to some HD Adelaide chairs and bench we bought last year. Rated 5 out of 5 by JK from This table is very nice! I bought 2!... This table is very nice! I bought 2! Rated 1 out of 5 by HomeDepotCustomer from Items were received damaged. ... Items were received damaged. Rated 5 out of 5 by Cameron from The overall quality was very good, and table was easy... The overall quality was very good, and table was easy to assemble. Rated 5 out of 5 by Malcolm from Good, solid tables, as useful indoors as out. Good, solid tables, as useful indoors as out. Rated 5 out of 5 by Brandon from Easy assembly, Wood looks nice.... Easy assembly, Wood looks nice.